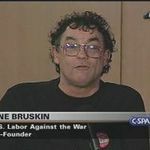 Gene Bruskin... is a 37 year veteran of the labor movement as a local union president, an organizer and campaign coordinator for numerous local and national unions. He worked as the labor director for the Reverend Jesse Jackson’s Rainbow Coalition and served as Secretary Treasurer for the Food and Allied Service Trades Department of the AFL-CIO. He was the UFCW Director for the successful Justice@Smithfield Campaign He has done extensive international labor solidarity work, including with Iraqi workers and unions, and is a founder of US Labor Against the War. He retired in September 2012 after establishing and leading the Strategic Campaigns Department for the AFT and is presently working as a consultant for several unions. After leaving SCLC, Jack O'Dell came to work with Rev. Jesse Jackson in the establishment of Operation Breadbasket and PUSH in Chicago; thereafter, he worked closely with Jackson during his presidential runs and in building the Rainbow Coalition. O’Dell not only played a critical role in developing strategic politics for the Rainbow, he also played an important role in bringing an internationalist perspective to Jackson, especially around the Mideast and the need for justice for Palestinians. Gene Bruskin, a longtime union activist and later the lead organizer with UFCW’s Smithfield organizing drive, had been on the Rainbow staff coordinating its work with unions and, in that capacity, he often met with O’Dell. In 1988 Gene Bruskin Boston, contributed an article to Forward Motion June issue "Hospital workers organize". He was an organizer for Local 66 of the Laundry and Dry Cleaning International Union, and formerly with the United Steelworkers. In 2008 Gene Bruskin was an officer of US Labor Against the War. Gene Bruskin pledged support for Bernie Sanders through Labor for Bernie, a "nationwide network of labor activists, backing Bernie Sanders' 2016 presidential campaign." This page was last modified on 17 November 2018, at 14:16.